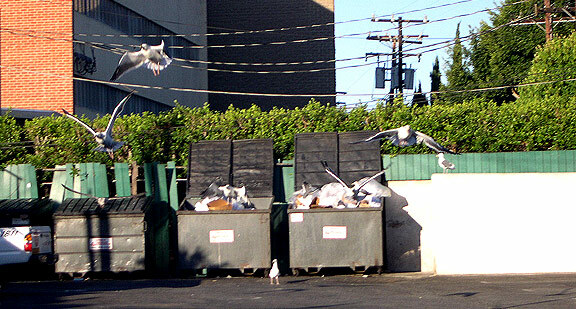 Downtown Culver City has really developed over the last year, especially in the food department. It has been sarcastically dubbed as “CuCi” for its semi-pricey lunch and dinner spots. But in the armpit of CuCi, behind Ugo, Fraiche, Bottle Rock and the BofA, there’s a little alleyway gem that still keeps it real. REAL CHEAP. Aesthetically, this place is a skidmark and sore thumb in an area of newer and trendier businesses. 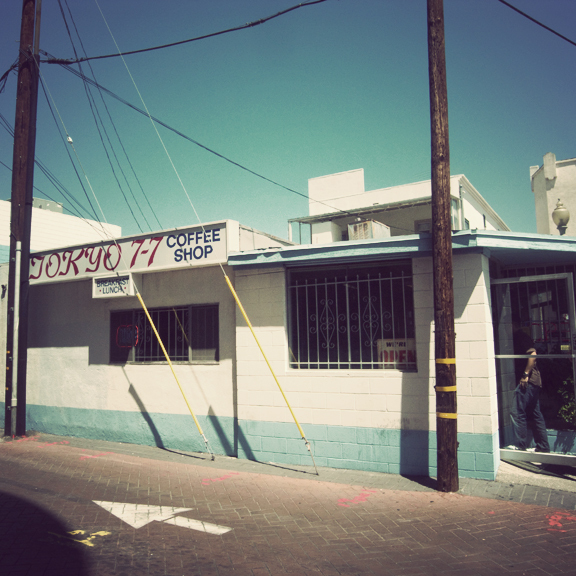 Introducing Tokyo 7-7 Coffee Shop, a place that has been run by old-school Japanese Americans since 1983. Maybe even 1883. I stumbled across this place when I was super poor one day during lunch. I was sick of Honey’s Kettle Fried Chicken, Fraiche and that one rib joint that is so so. I parked in the structure and there it was. Sure, why not. I walk in and the place has my favorite type of plastic wood paneling, adorned with autographed photos of the forgotten – Pat Morita of Karate Kid, random Japanese MLB players and a signed photo of Bob Sagat and The Full House cast. Nice, my kind of place. The place is run by three sweet older ladies with passable English and I knew right then that this would be an interesting cross cultural/divey diner experience. 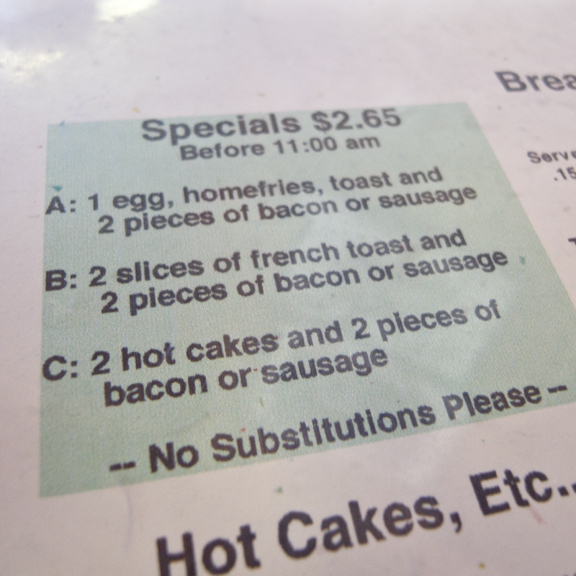 The first thing I see on the menu is a $2.65 breakfast special. Are you kidding me? I could order two of those and still be under $6, awesome. 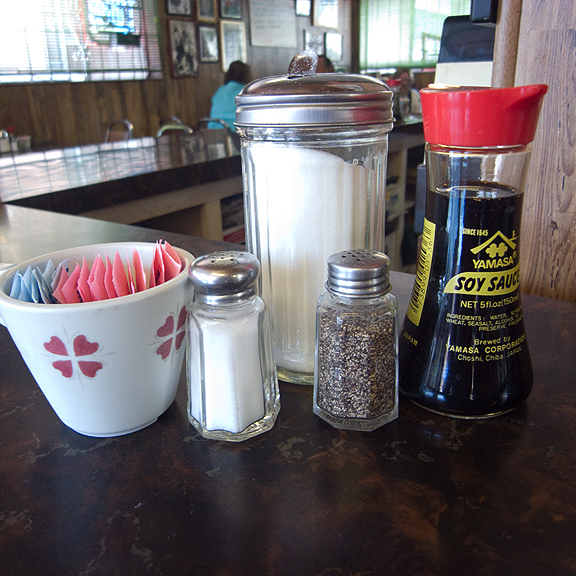 Sugar, S&P and Soy Sauce – not your typical Norm’s or Denny’s supply of condiments. 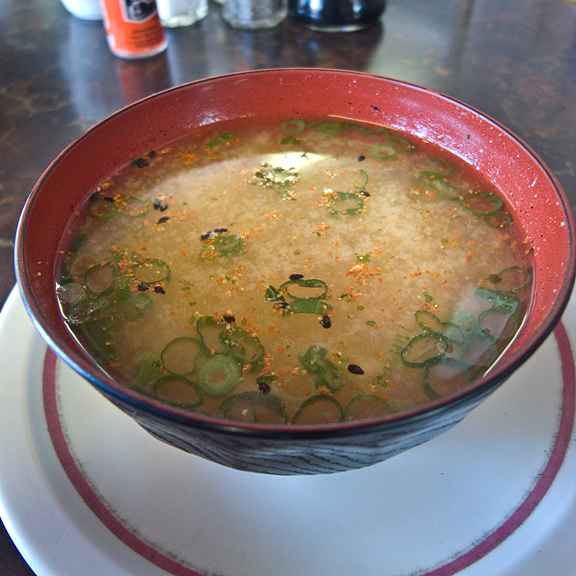 Besides your standard diner fare, you can order miso soup for $1.10. Ask for some Shichimi (Japanese chili pepper) to go with this. it USED TO BE $.90, but I understand times are tougher. For the Two Eggs category, you can pick your choice of meat. This is a true Japanese American/Hawaiian experience as they offer portuguese sausage and spam like Rutts Cafe over on Washington Blvd. 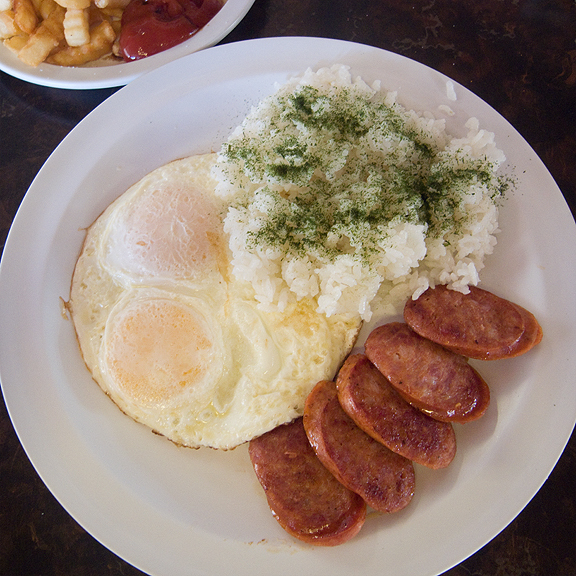 I always get Portuguese Sausage, Two Eggs with Rice and 2 slices of sourdough toast – all for $5 something. 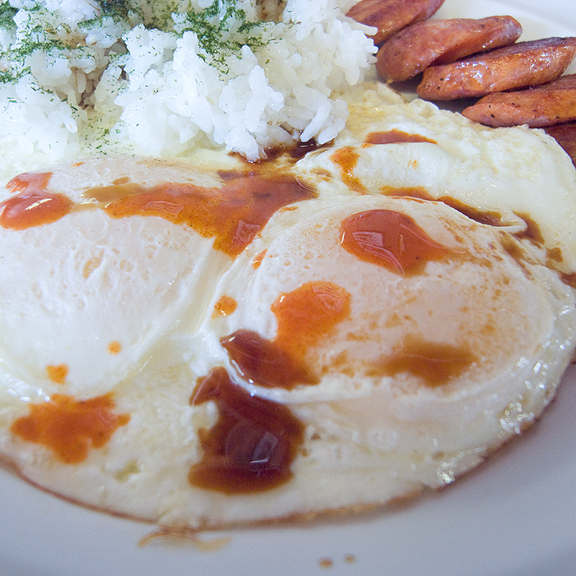 Add a little soy sauce on the rice and some soy/Tapatio on the eggs and you have your authentic South Bay Japanese American meal. In addition to the two eggs specials they offer yakisoba, some weird ramen and royals, which are omelets scrambled with soy sauce, onions and your choice of meat. The food here is not life changing but if you’re a sucker for wooden panel diners and older Japanese employees, this is a place that won’t damage your wallet. 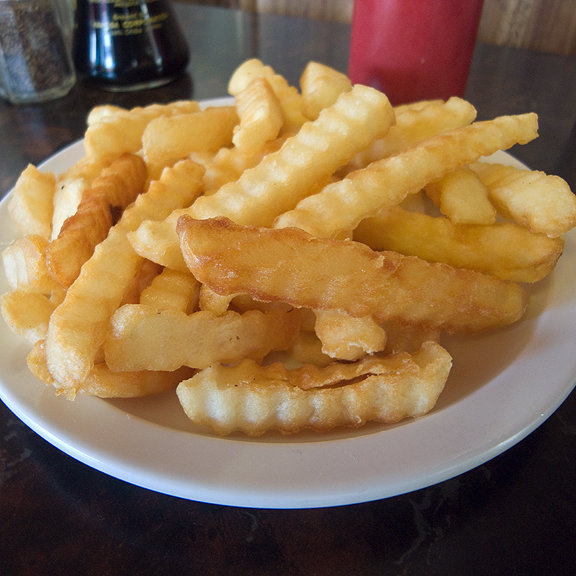 I think you can also get a burger, fries combo for something like $3.65. My total damage was like $8 and you can see all the food I got to eat, sans the toast. Hey, it’s still better than fast food right? Shichimi is also awesome on pizza, by the way, especially if you like it slightly hotter than the norm.